Security Printing and Minting Corporation of India Limited is going to recruit fresher candidates in India for Supervisor & Junior Office Assistant Posts. So, those candidates who are willing to work with this organization they May apply for this post. Last Date of Apply 01-May-2017. Total numbers of vacancies are 60 Posts. Only those candidates are eligible who have passed Graduation with at least 55% marks and computer knowledge with typing speed in English @ 40 wpm/ Hindi @ 30 wpm. 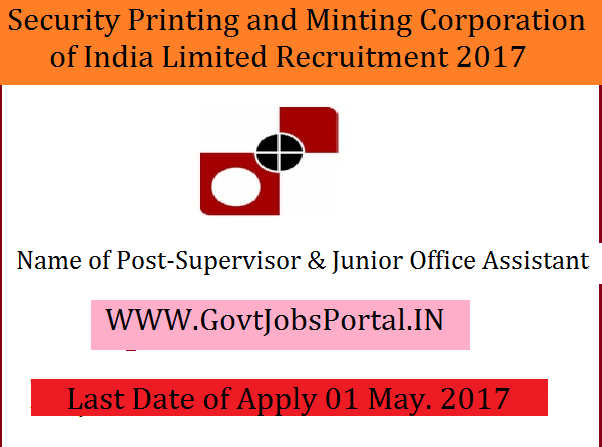 Indian citizen having age in between 18 to 38 years can apply for this Security Printing and Minting Corporation of India Limited Recruitment 2017. Educational Criteria: Only those candidates are eligible who have passed Graduation with at least 55% marks and computer knowledge with typing speed in English @ 40 wpm/ Hindi @ 30 wpm.